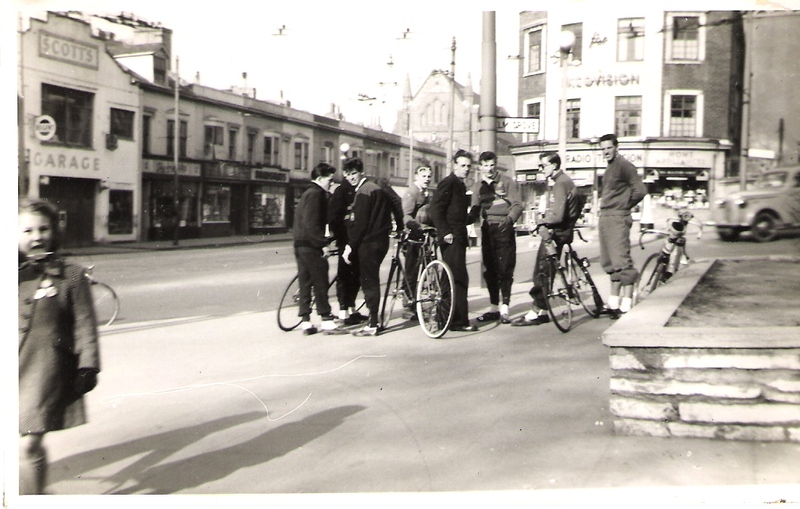 This is a photo taken in 1956 of the Brighton Excelsior Cycling Club afternoon club run, prior to meeting up with the main all-day club run, somewhere in Sussex. Having been racing in a 25 mile time trial early in the morning, we often used to meet at the bottom of Elm Grove if we were to cycle in the Lewes direction, to meet up with the main run at the “tea place” rendezvous. Those pictured in full view L to R are, Reggie Latham (a guest rider), Fred Cornhill, Vic Bath (myself), “Woggy” Brown (not riding that afternoon), Johnny Gunn, Gerry Atterbury and John Wallace. Where was the head quarters of your cycle club? In the 1950s my brother purchased a house in Mafeking Rd and up in the loft he found two expensive racing bikes. Me being his little brother, he gave me one. So I joined a club that was in Spring Street. That Sunday we all met up beside the Pavilion and started off to Haywards Heath. I just could not keep up with them, and by the time I reached Preston Park they were completely out of site: I gave up my membership. Back in the early 1950s, I rode for Brighton Velo Road Club which was formed in 1947 and was affiliated to the British League of Racing Cyclists. Top riders were Ron Pannell, John Haynes, Mike Holley, John Mitchell, Derek Miles, Ted Lynton and Brian Hutton. The club organised mass start road races and was one of the leading ‘League clubs’ in Britain. The Velo still hold annual reunions with many old riders in attendance (some of them still racing in veterans events) and also welcome members of other old Sussex ‘League’ clubs from Eastbourne and Lancing. In reply to Viv Webb’s comment above, Brighton Excelsior used to meet in 1955 at the top of Elm Grove in a church hall, which I am pretty sure was in Whippingham Road. In 1956 we used to meet in another hall near the Seven Dials, in or near Clifton Road. Those were the only two halls I went to as I discontinued my membership in 1957. I used to race on Preston Park track as a member of the NCU, the National Cyclists Union. I was also a member of the BLRC for one season in 1956 and rode in two events of theirs, one of which was organised by Brian Hutton who is mentioned by Phil Lovell in his comment above, this was a hill climb up Ditchling Beacon. Being a member of both cycling organizations in those days was rather unusual as I think there was friction between the two of them. These days the BCF, British Cyclists Federation, has superseded them. I joined the Brighton Mitre CC in 1946. I worked with a pre-war member of the Excelsior, so I knew about the club. I soon met other members of the Excelsior especially at Preston Park track. Although we were in different clubs we were all good friends. I joined the RAF in 1947 as a conscript and, after being demobbed in 1949, I was out with the Mitre one Sunday when we called into a pub up country and met a very nice looking young lady who was a member of the Excel, so we rode home together and arranged a date for the following Saturday evening. We went on a cycling holiday in Ireland that summer and I rode the Excel 100miles in 8 hours, which was run on a club ride, ie in twos, with about twenty riders. I also used to go to her house to ride on the rollers, and there was always other Excel riders in the house. So I have always had close connections with the club. I have remained in the Mitre since I joined. I knew most of the riders that you have mentioned. I helped set up the children’s club that Andrew coaches at the track. It is good to see the club is still very active. My Father Tony Barnard was a member of the club, does anyone remember him? I was a member of the Excelsior Club between 1959 and 1964. The headquarters then was in the basement of a church in Davigdor Road – opposite the end of Montefiore Road. I still proudly display my replica cup for best 12 hours of 212.5 miles in 1962. I got into more scrapes on club runs etc than I care to mention – being young and easily led at the time – but I always enjoyed my time with BECC – despite my disappointing time-trial results! Sad news today that Ron Pannell, one of the top BLRC riders in Sussex, died yesterday. Ron, who rode for Brighton Velo Club, turned professional and won many pretigious races, including the Vandervelde Grande Prix. Ron will be sadly missed by all his old cycling friends. I remember going to indoor cycle racing at the Dome. Rear wheels were in rollers, front wheel in a stand for stability .Large boards were behind each rider (looked like clocks) to show how many laps were completed. I rode for Brighton Velo in 1969. I remember Ron Pannell, and was sorry to read that he is no longer with us. Does anybody know what happened to Derek Cover: he was very active rider at that time. He had an electrical business, as well. I remember doing many massed start cycle races around Ashdown Forest, and down on the south coast near Rolands Castle and Cosham aerodrome. I am sorry to say that I have only just heard about the sad death of Ron Pannell, a rider who I came to know well through 1960’s Cyclo-Cross races. Ron was a really nice bloke, one of the best. We had a lot of laughs and I shall remember him fondly…RIP Ron. I last saw Brian Hutton’s name on the British Cycling Federation’s web-site, I think he is, or was, an area official at the time. It was a couple of years ago when I saw it. Gentlemen, I’m sure some of you will remember my brother Brian Leaney who was a BECC member in the late 40s early 1950s, and some may even remember our Dad, Alf (Dan) Leaney who, I think, was a founder member pre-war. My brother Lawrence joined the club in the late 50s and I joined in the late 60s. So I suppose you could say ‘it’s in the family’! Would love to hear from anyone who knew my dad. How well I remember the Sunday club runs with Brighton Velo. Fantastic times. Been living in Australia since 1969 and got back to riding in 1975. Still have my 26″ taper tube Gillott and at 77 still doing a bit of riding but now on a state of the art Cannondale (66cm frame) with all of the mod coms. Still in touch with Ben Dewdney and his wife Ronnie who keep me updated with events. Preston Park cycle track riders, early 50s included Derrick Arnold, Alan Gates, Alan Limbery, Mik Deacon, Mick Morton, Mick Hasler, Ray Betts, Ray Dagastino, Ernie & Freddie Johnson, Bob Savage, Terry Chambers, Colin Wittingham, Arthur Thorp, Eric Davey, Gerry Atterbury, Roy Whitehead, Keith Bishop. Cycle Clubs included the Wheelers, Nomads, Miter, Excelsior, Stanley, Uckfield, Bognor, Worthing, Southern Cross, Central Sussex, & Eastbourne. One of the riders I forgot was, Saunders, who had a sister who used to ride the track, for Southern Cross, there was an excellent lady rider of the Nomads, but I can not remember her name. On Whit Mondays they had an open meeting and used to attract top riders from England & Europe; from memory I remember two German riders ,Paul Vadder, & Manfred Domnick, they wore green &white check shirts & black shorts. Also the British sprint champion who gave our two best sprinters, Arnold & Hasler several lengths start, beat them easily. I can’t remember his name, (not Reg Harris) but I think he became world champion (not sure about that). I am only going by memory and will have missed people out, if anyone can remember anyone else post it on this site. Just come across this site. Ron Pannell was my best mate and after his retirement from racing we had many holidays just riding our bikes in Belgium, France and Italy. I was pleased that, in his later racing years, I was successful in getting sponsorship for quite a few riders, including Ron from my Bandleader / Boss Chris Barber. A sad loss of a terrific rider with enormous willpower and talent. Derek Cover is still going but has had health problems. Should anyone want to go to the 3-monthly lunches, get in touch with Eric Cloke on 01245-426670. Up the League! In response to Terry Hyde’s post, it may be Dave Handley that was the sprinter in the 50s that he was thinking of. He became a cycling coach for the Olympic team several years ago I recall. I have just come across the photo of Brighton Excelsior club run in the 1950s, nice to see my old technical college mate Reggie Latham there. I met him once, again on a visit to the college, when I was working as an engineering instructor at Lewes Prison. Is ‘Windows’ Whittingham still around? Sorry to read about Ron Pannell. Am now living in Thailand, secondly married to a Thai, enjoying life, but suffering ill health. My mother Margaret Fryer (now Budgen) was a member of the Brighton Excelsior club, it must have been in the mid to late 1940s. Her memory is not so good now, but she does remember Mr H. C. Strudwick who on leaving Allen West opened a cycle shop in Oxford Street, Brighton (she also worked at Allen West). Nothing to do with the cycling club but I recognise a couple of names on this page. Ashley and Lawrence Leaney, we lived at 81 Milner Road until 1955, their mother looked after my sister and I while my mother was in hospital having another baby. I rode with Brighton Velo in the early 50s. The ‘League’ was still in its early days. Have had contact with Gordon Wells, but since lost it. Once rode in the same event as Dave Bedwell, and, of course, was killed. Currently living in Australia, and still riding. Hello Vic, I’m a Brighton Excelsior rider but probably not as fast as you. The club has been updating its website recently, including the club history, so have a look and see if we’ve got it right. If it’s OK with you we’re going to use this wonderful picture. Kind regards. Jan H – that sounds familiar, as is your surname. You lived just opposite us then? Dennis Sutch – I grew up hearing about your cycling exploits with my big brother, Brian! London – Brighton tandem records? I have put some pics on Preston Park cycle track in the 50s. Can anyone put names to the riders? In reply to Vic Bath, yes it was Dave Handley, the fastest man I ever saw on a bike. I have lots of photos of the track 47-51. I had to go and do my National Service when I came back. I married Patsy Mitchel and became the “bread winner” and then could not afford to fall off on the track cos no work =no wages. It is just possible some of my track records are still mine because mine were in “miles” now its metric. I rode for England several times at Herne Hill. We all thought that the banking was steep but seeing it on TV now it was nothing. In my day a “tub” was £2-10 shillings in my case a weeks wages. I remember going to road races, we sometimes went in Tom Plummer’s cattle truck with most of straw and muck still on the floor. Happy days. Hi Vic - Great reading all the comments from the various ‘old uns’ , magical. Was a BECC member from the late 70’s , through the 80’s , 90’s , and the beginning of this millennium. Actually , I may well still be a member – better check that I’ve paid my subs! The incredible inter connecting matrix of cyclists was brought to mind during a chance conversation this morning(20/07/2017) with ‘Horry Hemsley’. I mentioned Keith Chandler -Sussex Nomads- to Horry, who promptly informed me that Keith’s Father , the great ‘Tiny’ Chandler(mentioned above by Dennis Sutch -29/04/2013) used to date Horry’s sister Joyce , Just before WW2 . Aren’t we just one big happy family. Hi Mark Barnard. I introduced Tony Barnard to the Excelsior Cycling Club. He was a friend of mine. In those days I rode a Claud Butler and helped arrange events, such as the 100 in 8. We used to meet at the Church Hall in Wippingham Road just off Elm Grove and played table tennis and often sang round the piano, played by Geoff Bishop. I worked at Allen West along with Derek Bennet. I now live in Belper in Derbyshire and am 82 years old. I can remember Ron Pannell. In the early 60s, he was an ‘independent’ rider for Bill Rament, a bike builder and a source of wisdom for young bike riders, who had a shop in Hove. I was probably the youngest member of the Brighton Velo Club. I remember Ron giving me a hard time because I couldn’t keep up with the rest of the members, when we went out for Sunday morning rides. He had a fearsome temper which he no doubt put to good use in his racing. He terrified me. Is there anyone who remembers Brian Leaney? he has dementia now, but often visits the track at Preston Park in Brighton and it would be so good for him to meet with anyone he used to cycle with, please email me if you know my dad many thanks. Brian Leaney has been speaking of Dennis Sutch, are you out there? if so will you email me or ring me on 07568353350. The Dome Brighton – 1949/50? Roller racing. I came 3rd in the Sussex Junior Championship race. I was in Prestonville Nomads. I would think we’re all gone by now?